What really are some distant astronomical bodies that seems like dust clouds? I bet it is a picture of a giant cloud of dust, bigger than a galaxy and made of asteroids and planets (instead of stars). But probably I'm wrong. What is that? 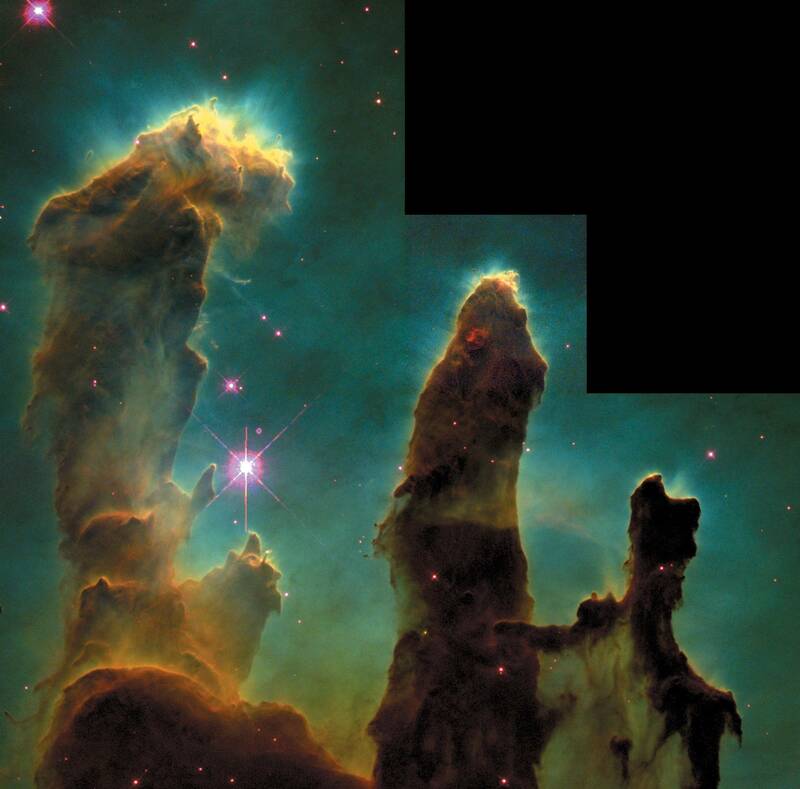 It's the Eagle Nebula as pictured by the Hubble Space Telescope, also known as the "Pillars of Creation" picture. The distance is 7,000 light years, so it's in the Milky Way (whose diameter is about 100,000 light years), of course. So yes, there is gas and dust but it's going to collapse into stars at some point. The size of the nebula is just 70 x 55 light years or so. The linear dimensions are about 10 times larger than the distance between the Sun and another closest star so such a volume of space could normally be expected to contain $O(1,000)$ stars or so. If you wanted the same apparent object to have distance e.g. 7 million instead of 7 thousand light years, which would be approximately needed for your "galactic" interpretation, the cloud would have to contain a million times more matter or so - to send the right number of photons here. Such an object would be comparably heavy as a galaxy but it would also move away from us and produce a detectable redshift. The above image was taken in optical wavelengths, in the inra red large portions are transparent, see : http://en.wikipedia.org/wiki/File:M16_-_Eagle_nebula.jpg, which describes the same object as viewed by NASA's Spitzer space telescope. Are the inner planets on planar orbits because there was more dust in the inner solar system (early on in planetary accretion)? Do red galaxies have red star-lit skies? Why are planetary systems so rare? Direct rocky planet formation without protostellar disk? Do we know what event caused the Sun and Solar System to form? How did the hubble deep field took pictures of far away galaxies? What orbit does a planet have to have to be a planet?